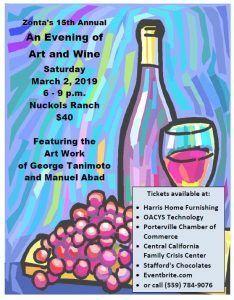 Evening of Art and Wine is our top class event where we feature our local artists and the best of the California wines. It is a fun-filled evening where friends get together and enjoy delectable hors d’oeuvres made by Zonta members while tasting various wines. It is an evening you do not want to miss. 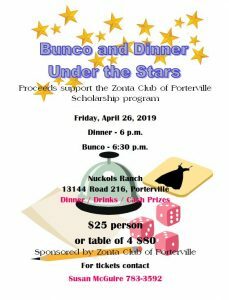 The attendance has been growing every year as the words gets out that Zonta women know how to throw a grand party!